The kindergarten students are becoming more aware of the world around them, both inside and outside of school. During a lesson on Christopher Columbus, the students re-enacted being on a ship during stormy weather. They also were able to re-enact arriving in the New World. The experience was aided by effects such as sounds of thunder and rain and posters of fruit and fauna. First-grade students are learning about leaders in social studies. They learned what it means to be a leader, and what leaders are called in our school, city, state, and country. Their learning was reinforced with a fun matching game! In history, second graders learned about America and its symbols and have become proud patriots! Students learned about our government and the people in it, the responsibilities of the president of the United States, and what the three branches of the government are. The next unit in history is a second-grade favorite: pilgrims and the Native Americans! The Third Grade is off to an exciting start to the year! They have moved from the very beginning of human history to the monumental grandeur of the Egyptian world. 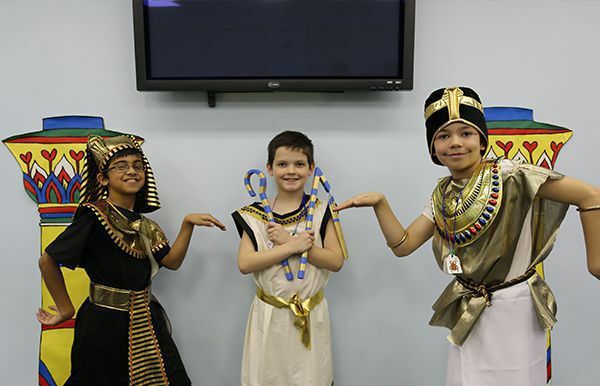 Along the way, third-grade students learned about the significance of the discovery of fire, the domestication of animals, and the invention of writing. The momentous accomplishments of the past have come alive through hands-on demonstrations and experiments. From experiencing the mechanical assistance provided by the wheel to the slow process of mummifying an apple, the growing lessons of history have borne fruit in the hands of the young scholars of Grade Three. The students of the fourth grade began the school year by digging deep into the roots of Western history. They started at the very beginning of European civilization with Minos and his palace at Knossos, and they won’t stop until they reach the conquests of Alexander the Great! As they learn about the mythology of the Classical Greeks, the fourth graders will get to experience what it is like to be a hero or demi-god first hand when they dive into their fall projects. Each student will take on the role of a character from mythology and present themselves to the class. The high days of the Dark Ages are not short of their share of violence for the sixth graders, as well. Having destroyed Rome as all but an empire of the mind in the West and seeing its decadent decline in the East, new usurpers have risen to take the glory of the Imperium. Most notable of these are the Franks, whose greatest leader claims the title of Emperor in his own right. Some, however, never knew the glory of Rome and are building cultures in England that provide real insight to how early Europeans lived in the shadow of monuments from the past, while establishing monumental works of literature, namely Beowulf. Finally, from the North, new worlds arise, bringing on dragon boats and promising a true culture shock. In the seventh grade, students are already starting to observe beautiful Renaissance art and architecture, analyzing cathedrals in order to understand how their shapes reflect the prevailing philosophy of the time in which they were built and examining sculpture and paintings for the methods used, stories told, and messages sent. They took these themes to the National Gallery on Nov. 7, when they were treated to several original Renaissance works in the collection. This work with primary sources opened the students to the beauty and true human feeling of the people and time periods on which they are focused in history class. One of the ways that makes history more accessible to students is using many primary sources in their studies, and students have been engaging in that activity already this year in Seventh and Eighth Grades. After learning about the major Native American regions of North America, the eighth graders completed a detailed analysis of a primary source packet. It included a published pamphlet from William Penn about the natives in his colony, engravings by Theodore de Bry based on John White’s watercolors of the Indians in the North Carolina area, oral traditions as told by tribal members and recorded by archaeologists, and personal diaries from settlers detailing their experience with the native tribes. These sources allowed the students to see the information from the textbook in a more personal way, conveying a visual image in many cases and a verbal expression of emotion and sometimes bias in other instances. The eighth graders used the skills developed in this activity when they visited Jamestown and Williamsburg in the middle of October to participate in extensive tours that corresponded with their class studies.